The NHL announced this week that disgraced defenceman Slava Voynov's suspension has been extended through the end of next season. But while critics are calling for a lifetime ban, some experts don't think a zero tolerance on domestic abuse is the answer. 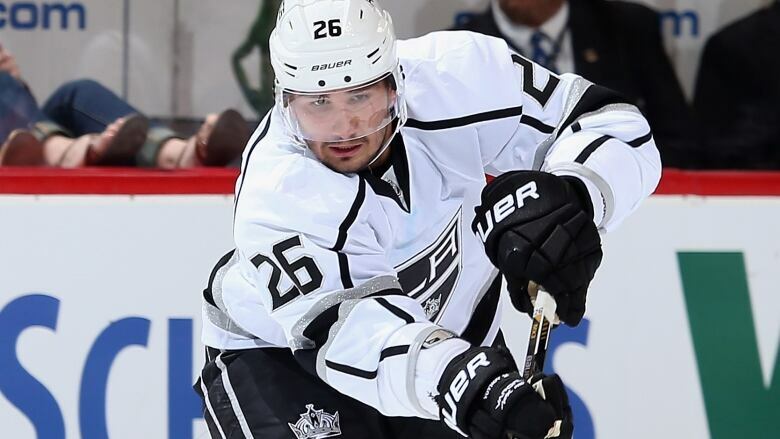 What to do with Slava Voynov? The NHL announced this week the disgraced defenceman's suspension has been extended through the end of next season. But after that, should a team wish to sign him, he can return to the NHL. The move has again ignited debate over how professional leagues treat both players charged or convicted of domestic abuse and their victims. Some point to the graphic facts in the Voynov case as reason to move toward a zero-tolerance policy or lifetime ban for perpetrators. The NHL Players' Association says Voynov's punishment — one of the stiffest in league history — has been long enough and will argue for a quicker return. Instead of focusing on if or when Voynov will return, others are using the case as an opportunity to look at different approaches to dealing with athlete-spouse violence. You may not be familiar Voynov's story. According to police, the master bedroom was covered in blood. Varlamova told police she'd been attacked by her husband and that it wasn't the first time. According to reports, the two had fought during a Halloween party and Voynov had punched her in the jaw. When the two returned home, according to reports, Voynov attempted to choke her numerous times and pushed her violently to the ground when she tried to get up. Voynov told police his wife sustained the injuries after falling out of bed. The NHL swiftly suspended Voynov. He eventually pleaded no contest to a misdemeanor charge of corporal injury to a spouse and was sentenced to 90 days in jail, avoiding a more serious felony charge. Varlamova refused to cooperate or testify. She wrote a letter to prosecutors stating an accident at home caused her injures. Voynov served two months in jail before returning to Russia. Last year, a judge dismissed Voynov's conviction. The move was opposed by prosecutors who said it was "impossible to determine" whether he met all of the conditions of probation after his plea because he returned to Russia. A doctor told the court Voynov had completed 28 domestic violence counseling sessions but said the couple had a "lack of emotional awareness and difficulty to communicate effectively." Critics in both mainstream and on social media point to the graphic details of Voynov's case as enough to ensure he never again plays in the NHL. (Voynov hasn't played in the league since his arrest. He played in Russia's Kontinental Hockey League from 2015-18 and did not play anywhere this past season.) They say his case would be the perfect time for the NHL to get tough on players like Voynov and declare a zero-tolerance policy when it comes to domestic violence. "We have no reason to believe that zero-tolerance policies deter further violence. The fact that leagues have taken action against people in the past doesn't seem to be stopping athletes from continuing their violence," said Leigh Goodmark, a law professor and director of the Gender Violence Clinic at the University of Maryland. Goodmark contends that these policies allow leagues to feel as if they have dealt with an issue, but it really only holds players financially accountable for what they've done. "When you cast someone out you don't give them any opportunity to change, you don't give them any support to make that change," Goodmark said. "If what we want is for people to change, we have to create pathways for that to happen and zero-tolerance policies don't do that." Varlamova's role in all of this also must be contemplated, or "the wife" as she is referred to in NHL media releases. Like many others in her shoes, she didn't want to see her husband punished. She didn't want to cooperate with the investigation and she certainly didn't want to take the witness stand. Take former NFL player Ray Rice. The notorious elevator video of Rice punching his wife Janay led to an intense discussion about domestic violence but also cost Rice his career. Despite the horrific video, Janay Rice wrote passionately about how upset she was about the demise of her husband's career. Other victims, including the partners of former NFL kicker Josh Brown and MLB pitcher Aroldis Chapman, have also encouraged officials to not move forward with charges or discipline despite horrific allegations. Katherine Redmond heads The National Coalition Against Violent Athletes. Redmond, who contributed to Major League Baseball's domestic violence policy, says victims need more assurances that coming forward won't mean potential financial hardship. "If the league decides to discipline a player, they need establish a fund for the spouses or an insurance policy for these spouses," Redmond said. "So they don't feel like they have to remain silent and just live through it with their kids." "These families get wrapped up in PR. I mean here they are deteriorating. There's really no support for the family," Redmond said. "The player is treated as an employee and teams say, 'Well, what do you want us to do? He's an employee. We don't have any obligation to this family.'" 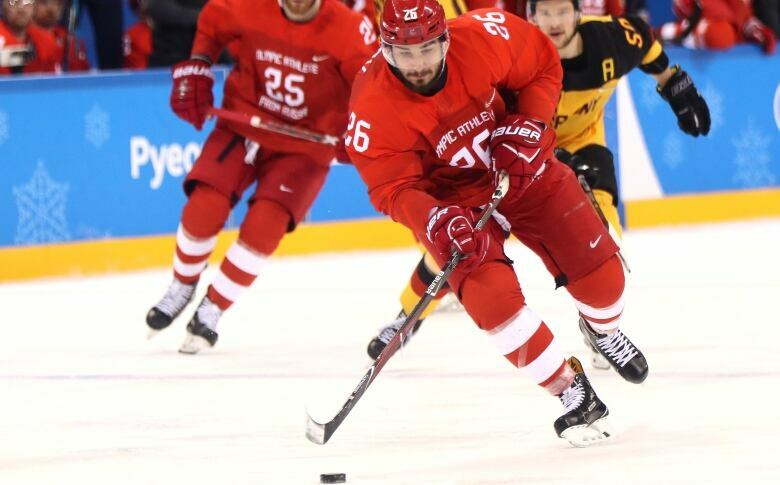 A look at social media shows numerous pictures of Voynov and his wife smiling, including some from the 2018 Olympics. More than five years after that violent night in Los Angeles, they appear to still be married. In making a case for his return, teams will likely be asking if Voynov has changed. Is he still prone to physical violence? Has he explored the root causes of what made him violent? We don't really know. Prosecutors say it's unclear how extensive any treatment Voynov or his wife may have received. Redmond says things like counselling need to be closely scrutinized. Redmond contends that in most situations the athlete has little interest in reform or rehabilitation; it is simply a means to get back on the field. "When a player injuries his ACL, there is surgery followed by a year committed to physical therapy and working it out constantly in the weight room." Redmond said. "When somebody is an abuser, it has been learned at a very early point in their life. To think that this person can go to even three months of therapy and come out saying, 'Wow I've really realized what I've done'. No, he has to get to the point of admitting, as cliché as it sounds, he has this problem and he doesn't like its effects." Goodmark says athletes must be able to show real accountability for what they have done. She points to the exiled Rice, who speaks regularly about intimate partner violence, the very topic that ended his career. "I don't think real accountability is you lose your job and that's that. I think real accountability is you accept responsibility for what you've done. You have to reflect on it. You have to share those experiences with other people and give other people the opportunity to call you on your behaviour,"Goodmark said. "Imagine if teams required not the photo-op type experience, but some actual deep work around these issues within communities rather than just giving somebody a free pass back."